One of the greatest things about Apple’s iPhone 7 Plus has to be the battery life. While Android users jump through hoops to eek 12 hours of battery life out of their phones, your Apple phablet gives you 24 hours no problem. Of course, battery life is like money and you can never really have enough, but the iPhone 7 Plus is already a very large phone so slapping a big bulky battery case on it is out of the question. 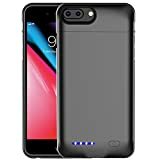 What you need is an ultra-thin Sunwell iPhone 7 Plus Battery Case, which gives you an extra 4,000 mAh of charge and somehow only adds 0.17 inches of thickness to your iPhone. Four Lights Show Exactly Power Left: With the smart battery case on, when you click the bottom, there are 4lights to show exactly how much charge you have left. The Case Supports Lightning Accessories: Such As the Lightning to USB Cable (included with your iPhone), and Works with the iPhone Lightning dock. Thinnest & Most Affordable iPhone 7 plus case Battery: It is not Only a Power Bank, But also a Phone case, 2 in 1 unit.Slim volume, high energy density, compared with the same capacity battery, Sunwell iPhone 7 plus case battery is much more thinner and lighter than others. Magnetic suction function: You Can Use During Driving.